Various universe evolution scenarios. A universe with too much density collapses in on itself, a critical density universe stays static, while a universe with not enough density keeps expanding at a steady (coasting) rate. However, today's cosmology puts emphasis upon the cosmological constant, which gives an accelerating expansion. Does this mean that density is irrelevant? Credit: NASA. A remarkable finding of the early 21st century, that kind of sits alongside the Nobel prize winning discovery of the universes accelerating expansion, is the finding that the universe is geometrically flat. This is a remarkable and unexpected feature of a universe that is expanding  let alone one that is expanding at an accelerated rate  and like the accelerating expansion, it is a key feature of our current standard model of the universe. It may be that the flatness is just a consequence of the accelerating expansion  but to date this cannot be stated conclusively.  closed universe  with a contents so dense that the universes space-time geometry is drawn in upon itself in a hyper-spherical shape. Ultimately such a universe would be expected to collapse in on itself in a big crunch.  open universe  without sufficient density to draw in space-time, producing an outflung hyperbolic geometry  commonly called a saddle-shape  with a destiny to expand forever.  flat universe  with a just right density  although an unclear destiny. The Friedmann equations were used in twentieth century cosmology to try and determine the ultimate fate of our universe, with few people thinking that the flat scenario would be a likely finding  since a universe might be expected to only stay flat for a short period, before shifting to an open (or closed) state because its expansion (or contraction) would alter the density of its contents. Although the contents of the early universe may have just been matter, we now must add dark energy to explain the universe's persistent flatness. Credit: NASA. Matter density was assumed to be key to geometry  and estimates of the matter density of our universe came to around 0.2 atoms per cubic metre, while the relevant part of the Friedmann equations calculated that the critical density required to keep our universe flat would be 5 atoms per cubic metre. Since we could only find 4% of the required critical density, this suggested that we probably lived in an open universe  but then we started coming up with ways to measure the universes geometry directly. Theres a You-Tube of Lawrence Krauss (of Physics of Star Trek fame) explaining how this is done with cosmic microwave background data (from WMAP and earlier experiments)  where the CMB mapped on the sky represents one side of a triangle with you at its opposite apex looking out along its two other sides. The angles of the triangle can then be measured, which will add up to 180 degrees in a flat (Euclidean) universe, more than 180 in a closed universe and less than 180 in an open universe. Krauss: Why the universe probably is flat (video). These findings, indicating that the universe was remarkably flat, came at the turn of the century around the same time that the 1998 accelerated expansion finding was announced. So really, it is the universes flatness and the estimate that there is only 4% (0.2 atoms per metre) of the matter density required to keep it flat that drives us to call on dark stuff to explain the universe. Indeed we cant easily call on just matter, light or dark, to account for how our universe sustains its critical density in the face of expansion, let alone accelerated expansion  since whatever it is appears out of nowhere. So, we appeal to dark energy to make up the deficit  without having a clue what it is. Given how little relevance conventional matter appears to have in our universes geometry, one might question the continuing relevance of the Friedmann equations in modern cosmology. There is more recent interest in the De Sitter universe, another Einstein field equation solution which models a universe with no matter content  its expansion and evolution being entirely the result of the cosmological constant. De Sitter universes, at least on paper, can be made to expand with accelerating expansion and remain spatially flat  much like our universe. 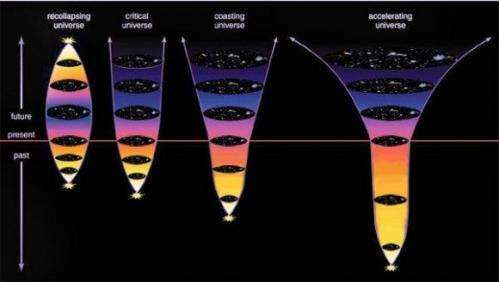 From this, it is tempting to suggest that universes naturally stay flat while they undergo accelerated expansion  because thats what universes do, their contents having little direct influence on their long-term evolution or their large-scale geometry. But who knows really  we are both literally and metaphorically working in the dark on this. For every article like this one I can cite another article, which is claiming exactly the opposite. In another words, you can write what you want about Universe today - which is definitely not good with respect to public belief in mainstream cosmology. The dense aether model provides explanation of this conceptual confusion with water surface model. The water surface can remain fully flat from perspective of the observer from outside (who is using the light waves for its observation) - but from perspective of the observer at the water surface (who is using surface ripples as the only source of observation) the water surface appears expanding, collapsing or steady state, depending on the wavelength of light, in which he is observing it. The situation can be even complicated with fact, even the water surface is never completely flat, so we would observe the space-time deformation even if we would observe it from steady-state perspective (compare the Doppler anisotropy of CMBR or fine structure constant, dark flow, parity violation and another findings observed recently at the cosmic scale). Stop it, dense aether theory is elephants on turtles' backs, all the way down. Technically yes, as it's trying to describe the Universe from the opposite, outer and more general perspective perspective. The similar situation occurred before four hundreds of years, when Galileo and others started to promote the extrinsic perspective of solar system. Whereas the existing models were based on epicycle perspective of planetary motion, i.e. the perspective of human observer, who is sitting on the Earth and who is observing the solar system from inside. The point is, the extrinsic perspective is more difficult to prove (believe it or not, we still never observed the planetary motion of Solar system from outside) - but it simplifies and reconciles the existing rigorous models, which are based on intrinsic perspective. The experts are never happy from such turnaround, because they must learn new paradigms and they're facing the lost of jobs connected with reduction of old theories. 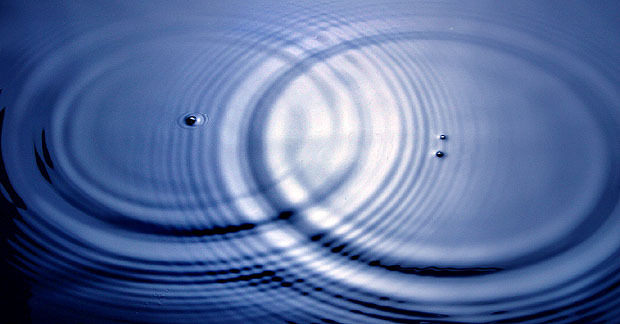 If we would observe the water surface with its own waves from average distance, then the perspective mediated with background independent surface ripples will dominate - so that the appearance of water surface can be described quite well with general relativity (FLRW metric based on relativity in particular). But with increasing scope of telescopes we are reaching the area, when all surface ripples disperse into underwater. Under such a situation we are observing the observable part of Universe both from intrinsic, both from extrinsic perspective at the same moment and both approaches will converge mutually. In dense aether model the event horizon of black holes represents the fragments of outer surface of Universe, as being observed from inside it from perspective of distant past. And the surface of elementary particles represents its inner surface, as being observed from perspective of distant future of Universe. Such geometry may appear pretty strange for someone - but we should realize, the space-time represented with physical vacuum has a foamy structure and the light is spreading along membranes of this foam. In foam it's quite normal to observe the things both from inside, both from outside at the same moment. Try to imagine the shinning light bulb in the deep bucket covered with pile of foam. Whole volume of foam will glow - not just interior of bucket. Which means, we can observe the bucket both from outside, both from inside of it, because the light of bulb is heavily dispersed into all directions possible. You can remember the Möbius strip and/or Klein bottle geometry in this connection. Leads me thinking that the Universe "tries" to stay flat by expanding Spacetime, like light "tries" to keep its speed by contracting spacetime. That's an interesting idea. Light doesn't contract space-time, but I think I see what you're trying to say. The speed of light is really a measure of a space-time boundary, and there may be a connection between that measure of space-time and its flatness. Or something. You guys with these theories seem to forget that we aren't observing from outside a foam bucket or the surface of water. We would be IN it. Explain how we can observe surface changes while being submerged in your wether. What would be the effects on spontaneous emission, the Casimir effect, van der Waals bonds, Lamb shift, etc in a universe undergoing a collapse ? I don't think he explained why the observations are wrong, or rather what could have made the observations give the wrong result instead of what he expected. Anyone have a link to more of his lecture? So I'm slightly confused... if dark matter was 63% prevalent 13.7 billion years ago and now it is 23% that is a 40% difference.. take the 25% of both photons and neutrinos and add that to the 40% we get 65% hmm.. now where can we get this other 7% from? 12%-4.6 equals 7.4% add that to the original 65% and we get 72.4% which is the amount or "estimated amout" of dark energy... how is that those numbers all added up and worked out to be 72%? AF: Don't try to math your way between the two pie charts. Dark Matter and Dark Energy are plugs, placeholders, unknown things that are observed, but as of yet unexplained and not yet completely understood. The DM amount in the early universe is what is required to make the BB work using the theories we have now. Theories that have been supported time and time again by our most accurate measurements of experiments and observations of the universe. The DM amount currently is more of the same; what is necessary for the universe to work if our current standard model is correct. The DE similarly to explain our observations (flatness/red-shift). DE may have been there all along, not doing anything, and only recently has been "turned-on" and is influencing the Universe. Or maybe it is all wrong and something else is going on at the grandest scale. In any event, don't math your way between the two charts, that isn't what they are meant to be used for. That is, compress a spring (or spacetime if you imagine it to be compressibile - it certainly is expandable). There's lots of energy there but you never know it until you release the compression. So - DE may be there and have been there all along in the form of some potential energy beginning to be released at the big bang. So what happens when the compression energy is all used up (assuming it is finite) - does spacetime (the springs) continue to fly apart? Yes, maybe, but the acceleration stops. But what happens if the springs hang together and begin to be stretched? It could be deja vu all over again. My eternal Gratitude for this wondrously vague article. "we are both literally and metaphorically working in the dark on this." Being "7th Dan Black Beat" in the art of self satisfaction I can assure you that making your hand go to sleep as well it heightens the pleasure of "The Stranger"
(http://www.urband...ranger), I also find the excited utterance "Replant Neutrons Assemble" makes my day. There's another implicit assumption, that the inertial frame is the same everywhere. We're inferring the strength of the gravitational field from this. Perhaps what's really happening is something like Mach's principle. Matter near the centre of a galaxy sees lots of matter around it so experiences a large centrifugal force whereas on the outskirts of the galaxy (or in dwarf galaxies) there's less matter to constrain the rotation. I thought centrifugal force comes from rotation? Maybe objects aroung the center affect its rotation? Interesting. sun is not flat with Earth Planet ? Even the Milky defies your Flat-Universe Logic ? Sub: Back to Square One? Where lies Cosmological Index! Cosmology needs best of brains trust.Understanging Nature and Philosophy is a long way for Comprehension. Basic functions-Source,Fields,Flows,Reflectors are ignored-Leave alone protective functional Index. From and above these Concepts, One needs to define Cosmology and identify Prime concepts. My name is Hush. That's how people address me when they do not want to hear...any shape. I also want to continue my thought here- based on this and the fact that there was an article that found a particle traveling 12 nanoseconds faster than the speed of light - Einsteins theory is off. Close but off. Look at the universe from the edge looking in. If energy is = mass x multiple of light squared and in this article it clearly states that the universe = 0 total energy- then the equation is wrong.because 0 = total mmass of universe x total multiple of light 2 would not = 0. Either the math for the total energy of universe is wrong, or einstein is wrong, or at the very edge of the constantly expanding universe, physics would not apply. Maybe time is not expressable as would be in a closed universe ? I am just an amature theorist but does anyone else see this? and if total energy is 0 then einsteins theory is wrong. based on this and an article that they have found a pareticle traveling 12 nano seconds faster than light leads me to believe it is close but not correct and maybe we are a closed universe. but there is plenty of room for wider speculation about why we live in a flat Universe when most Astronomers based on observations would expect we live in an open Universe, but as the old saying goes, you have to take it as you find it, all pet theories aside. It is taking Gravity as negative or purely attractive into account in Einstein's Theory which indicates the paradoxial effect that the energy content of the Universe may be zero. Einstein's theory isn't wrong, the statement that the Energy content of the Universe =0 is an explanatory guess as to why space is flat, as measured, and an attempt to remove all curvature by making the energy content =0, through the negative contributions of Gravity, could just possibly be the right answer. and demonstrates. The reference to "correcting" the Reimanian meric tensor, means just that making sure it does and can maintain the "correct" curvature through constant change in scale over time, otherwise you create anamolies which destroy the ability to measure the resultant curve and cannot prove the theorom of the contraction of a sphere in all three dimensions down to a single point. I should also point out here that while Perlman demonstrated that this can be done, still the anamolies, or as the main mathematicians call them singularities occur, and to prove the theorem requires mathematical "surgery" so to speak to cut through these "Singular" Points to reveal the proper curvature that results, a kind of flat/thin two piece resultant topologicl metric, that retains the three dimensional characteristics of the sphere which was constricted. Not so much proving as you state that everything resolves down to a sphere, But that spherical objects can be contracted into shapes based on their dimensionality that have the characteristics of the Geometrical form from which they were constructed. Proving that that was the form they held in the first place. A nice conjecture, and even finer proof, which is the essence of Homology or topological transformations of geometrical dimensionality based on that dimensionality. Hush, you are more than 'out of shape'. You are bent and twisted more than the spacetime curvature that you need to dismiss Euclid. Interesting though. I thought with a US accent it would be more like 'rah-jar'. Here, its more like 'roh-ja'. In any case a worthwhile distraction. Perhaps, the greatest questions of the Universe will ultimately be discovered as nothing more than pure economics distilled into the most simple terms. If we accept as fact that we reside in this universe, might it be the universe also resides in us? At the very general level the behavior of people can be approximated with energy spreading in dense gas, because at the sufficiently global level all intelligent motivations of individuals compensate mutually in accordance to principle "what is good for you isn't god for me". As the result, at the sufficiently general level the global economics is behaving like fluctuations of dense gas and it's literally out of control and it evolves independently to human consciousness like the new level of observable reality. The behavior of Universe at the very general scale can be approximated in the same way: the galaxies are condensing and evaporating like giant fluctuations of hypothetical dense gas in AWT model. The convergence of both approaches illustrates, your insight has some merit in context of dense aether model. I'm using the socioeconomical analogies often, when explaining various aspects of observable Universe and vice-versa. The evolutionary cycles of empires share many common aspects with evolution of galaxies, etc. For example, every large sectarian state or community is behaving like the black hole, filled with boson condensate. It's rigid and nontransparent from outer perspective due the censorship, whereas from inner perspective it behaves like superfluous environment without friction, because the individualistic thinking is driven with propaganda there. Maybe it will motivate you in another thinking in this direction. Well Callippo maybe human thinking is driven by the uncertainty principle? I guess our reputation precedes us wherever I go. Sort of like Charlie Brown's friend Linus? ...and maybe we are a closed universe. Flat - by actual measurement, as in the de Sitter solution to GR. Riding on top of this basic solution are some minor(?) perturbations caused by the uncertainty principle - the creation of matter/antimatter. Dark matter I attribute to turbulence in the de Sitter spacetime expansion function caused by the uncertainty principle. You might look at it as de Sitter (spacetime) is the carrier frequency and matter and radiation are AM and FM modulation. In a previous life I used to sit in second-year French class with a frat bro who tempted me with his cigarettes. I obliged. We sat in the second row with our feet propped up on the front row seats and blew smoke rings up on the blackboard. Nobody really cared that much since we were the only two in the class. We got pretty good at it. I didn't realize at the time that I was simulating rings of high-density spacetime (dark matter) blown away by the BB and later forming galaxies. So the U is a happy hybrid of GR and QM. May the two live happily thereafter. There was another article on Physorg describing the ergodic properties of elements of dynamic systems (I call them fractals). The article stated that repeated observation of an element of a system, in fact predicted how that dynamic system acted. I think I heard this from Hawking but he was only talking about mass and gravitational potential energy. I would extend it to anti-matter and anti-gravitational potential energy (if you've been around much you've probably encountered my theory of anti-gravity). ...Physics should also be able to predict when the outward force will stop and when the universe will begin its steady force over time of collapsing upon itself, its apex then its return correct given it is flat ? I suppose expansion will stop when the dark energy is used up, assuming it is finite. So the dark energy is now 73% of the total. 27% was used up in 13.7 billion years, so I guess you can do the math for when it will stop expanding and start contracting and returning mass/energy to the dark energy. I'm assuming conservation of energy over time. ...if the universe is expanding, what is it expanding from ? From the dark energy, I suppose, concentrated in a very small (maybe Plank) volume. ...what is "outside" the conical shape? The void, I suppose, if anything. Others I guess say the vacuum. Yes, some say an infinite number of situations - everywhere throughout all time and before if there is such a thing, but I don't work with the hyperreals. That seems to imply a zero volume. The uncertainty principle would rule that out. Another reference to Linus? Sorry. ..At the very general level the behavior of people can be approximated with energy spreading in dense gas ... Another reference to Linus? Sorry. In recent time various thermodynamical models of human evolution became popular. What do you think the thermodynamics is all about? Isn't it a bit sad, when the people, who are visiting physorg regularly cannot even remember the articles presented just here? You people are of zero memory, not to say about ability to combine the existing knowledge. Instead of it, your ability to downvote everything, which you're not familiar with is extremely well developed. As the result, the people who can remember and combine stuffs are systematically oppressed with people, who cannot do it. The trolls always win with their very nature.